Episode 12 – Conan the Barbarian | Radio vs. the Martians! This entry was posted in New Episode and tagged anti-heroes, arnold schwarzenegger, barry smith, cimmeria, comics, conan, conan the adventurer, conan the barbarian, dark horse comics, edgar rice burroughs, fantasy, frank frazetta, greg hatcher, h.p. lovecraft, hyborian age, jason momoa, john buscema, john carter of mars, john milius, jonah hex, marvel comics, panel, pantherish, pol rua, power fantasy, pulp, rich people are assholes, robert e howard, roy thomas. alfredo alcala, savage sword of conan, stan lee, the card line, the man with no name, the warriors, the west wing, weird tales, wizards by Mike Gillis. Bookmark the permalink. Speaking of corrections, I mixed up Dave Campiti with Dave CAMPBELL. Mr. Campbell is the blogger from Dave’s Long Box– David Campiti is a comics creator. Brain fart. My apologies to both Daves. Also , the Howard small-press hardcovers from the 1970s I mentioned were from Donald M. Grant, not Viking. …but apart from that I think it’s all accurate, he added defensively. K, I must agree the movies are a low point, even though the Arnie movie was my first introduction to Conan. It was also a point of connection with my dad, and a small rebellious win as a child when I got to stay up late to watch it with my dad on TV. As bad as it was, I will still watch it because it has so many emotional connections for me. It possibly is the reason I love those so-bad-they’re-good sword and sorcery movies of the 80s. I actually have tremendous affection for THE SWORD AND THE SORCERER, which is kind of a hot mess of a Howard pastiche. You literally can see the bits Albert Pyun and company lifted bag and baggage from the Conan stories, but then massively screwed up (my favorite being where Talon is crucified, much as Conan was in “A Witch Shall Be Born,” only to rip his hands free and then engage in THREE different climactic battles with his twenty-pound three-bladed sword, all with gaping holes in both hands that have somehow miraculously healed over by the end of the last fight with Cromwell.) Nevertheless it captures the spirit of Conan more than the actual Conan movies ever did. Likewise I rather like KULL with Kevin Sorbo– it’s nothing at all to do with Kull but looks more like a half-baked adaptation of THE HOUR OF THE DRAGON. Which I gather it actually started as. L. Sprague DeCamp consulted on it, which is why details like “by Valka” and “By this axe I rule!” made it in there, but again, it’s much more of a King Conan pastiche than an actual Kull movie. Sorbo is horribly miscast and basically plays it as Hercules redux, but it’s still a good time. …but it’s terrible as an adaptation of the source material and the character. I probably wouldn’t think of it as fondly as I do if I had been familiar with Conan before seeing it. I think that People of the Black Circle would make a great movie, if they adapted it. But I really think the character would work best with a format like BBC’s Sherlock. Three or four movie-length episodes a season, with a mix of adaptations of Howard stories and original stories by people who get the character. I’d love to see Jason Mamoa back in the role, too. But I share Greg’s appraisal of the likelihood of this happening. If they did it, and did it well, I’m confident that it would be a hit. 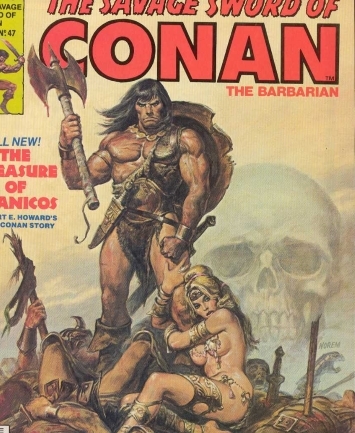 I remember reading a Conan comic in a comic store one time that, for the life of me, I can’t track down. As I recall, which after googling seems to have been incorrect, it had ‘Hyperborean’ in the title and the plot that impressed me dealt with mythical hyperboreans that Conan journeyed. They were not extinct as Conan thought, but were a race of gray giants that had mastered magic in all of its forms and were functionally bored immortals; Conan is enslaved to amuse them in the arena, but they regularly succumb to ennui and walk off of a cliff to commit suicide, taking all of their slaves with them. Needless to say that Conan escapes, but does anyone know where this comic is collected and who the publisher is? Well worth picking up! Busiek really gets the character, and Nord’s artwork is glorious. I’m sorry, not a one-off but an ongoing series since 2009. Finally found the time to listen to your show today – great job, everybody! This may be my favorite yet. First, I wanted to thank Mike so much for giving a shout-out to Roy Thomas. I agree that his role in the re-popularization of Conan in the 1970s cannot be emphasized enough. Personally, I often wonder if – as good as Howard’s original stories are – we would have had the entire Conan phenomenon/industry we do today if it had not been for Thomas pushing for Marvel to get the comics license, and then working so hard on writing/editing both the color and b&w comic series for all those years. Second, on the subject of the movies, I agree that the two from the early ’80s are complete disappointments (and in the second one, Grace Jones basically outdid Arnie – SHE should have been the main character). I haven’t seen the most recent one, so I can’t comment, but as I understand it, it suffered from some of the same problems. I think what should be done, as noted above here in the comments (and I think the topic came up in the last year or two in Greg’s column at CSBG), is to simply adapt any one of Howard’s original stories. And any of the comics from the ’70s (especially from Savage Sword) can serve as storyboards. Also, I just have to say I loved the observation that the West Wing is total power fantasy/wish fulfillment for libs and progressives – I always thought that whenever I watched the show.